in perfect alignment with the eastern gate. 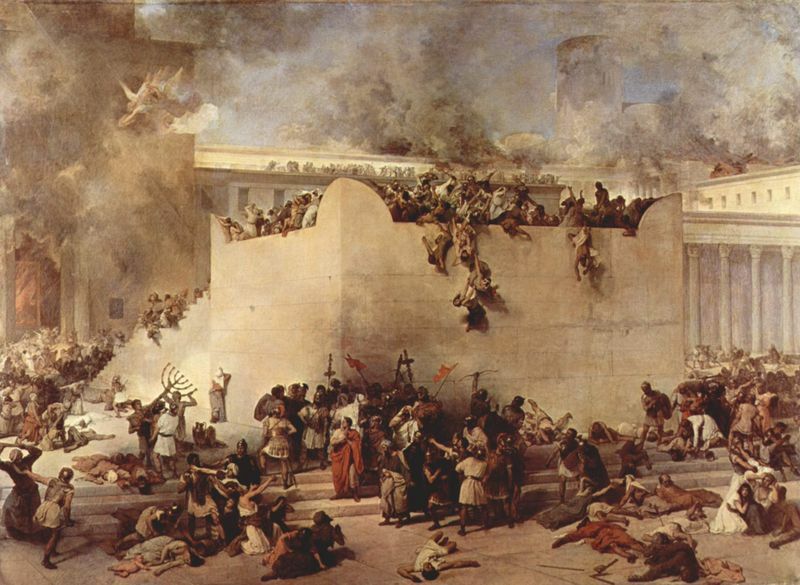 The destruction of the Jewish Temple in 70 A.D.
Jerusalem has seen two temples built on the Temple Mount. The first was built by King Solomon close to 3,000 years ago. It was destroyed by the armies of Nebuchadnezzar in 586 B.C. The second temple was built under Zerubbabel during the years 520-516 B.C. This was destroyed in 70 A.D. by rogue elements within the legions of the Roman General Titus during the sacking of Jerusalem. The record of the Jewish historian, Josephus, embedded with the Roman forces, is very clear. It was a renegade democratic/anarchistic mob from the Roman Army, acting against orders, who instigated and perpetrated this sacrilege. The mobs had gathered at the Temple. Then in a wild frenzy they rushed in to set fire to it. Josephus was there. He reports that General Titus himself tried valiantly to prevent this wanton destruction of the Temple. The Roman general actually took up sword and fought against these evil rampaging elements rising up within the ranks of his own army. These soldiers had broken military order. This is a very important fact of history. No order to destroy the Temple had ever been given. This riotous act of plunder and mayhem had in no way ever been authorized by any Roman military authority. Titus had previously met with three of his generals. All of them had agreed that when Jerusalem was taken the Temple would be spared. These soldiers were completely out of line. They were acting on their own whim and against orders. The conclusion we are drawn to here is this. The impetus to destroy the Jewish Temple did not come from a Roman governmental spirit at all, or any other governmental spirit for that matter. When we get right down to the root cause this was a devilish impetus operating in a mob. The people involved broke from proper military order and proceeded to desecrate the holy things of the God of Abraham, Isaac, and Jacob. So the spirit operating here at the destruction of the Second Temple was far more sinister, occult, and hidden from view than we have been told. And from the prophetic Scriptures we shall see that this destroying desecrating agency at work here was actually an anti-Throne of David, anti-Semitic, anti-Messiah, or Anti-Christ spirit. This hideously evil spirit is well known in Jewish history and spoken about in Holy Writ. We saw the spirit become a demon and possess the Greek leader Antiochus Epiphanes during that former era. He slaughtered a pig on the altar and desecrated the Temple. This act of profaning the holy things of God initiated the Maccabean uprising. IN 168 B.C. THE GREEK SELEUCID RULER ANTIOCHUS COMMITTED AN ABOMINABLE SACRILEGE IN THE 2ND TEMPLE. ANOTHER WORLD RULER, THE FUTURE ANTICHRIST, WILL BLASPHEME GOD IN A SIMILAR WAY IN THE LATTER DAYS. HE WILL BE POSSESSED BY THE VERY SAME BEAST DEMON OF THE ABYSS THAT POSSESSED ANTIOCHUS IN THE FORMER GREEK ERA. THIS FUTURE "ABOMINATION THAT MAKES DESOLATE" WAS SPOKEN OF BY DANIEL AND CONFIRMED BY JESUS IN THE OLIVET DISCOURSE. THIS AWFUL BLASPHEMY WILL BE COMMITTED MIDWAY THROUGH THE FINAL SEVEN YEARS OF THIS AGE. THIS 'ABOMINATION THAT CAUSES ASTOUNDING DESOLATION' WILL BE COMMITTED IN A THIRD TEMPLE YET TO BE REBUILT. The prophet Daniel had written concerning this sacriligious spirit that becomes a demon way back in the 5th century B.C.. In later centuries the spirit would rise up from the Abyss and become a demon to possess a human ruler. This would happen on two separate occasions. Daniel chapter 11 gives us an outline of the first of these two abominable leaders. The Seleucid tyrant Antiochus was first world leader to be possessed by the thing. In the latter part of chapter 11 Daniel describes the future latter day emergence and demonic possession of a second world leader who will go on to become a monstrous tyrant. So Daniel chapter 11 is a biphasic saga with two possessions separated by two+ millennia of human history. The chapter begins by speaking of the Greek Seleucid ruler Antiochus Epiphanes. He slaughtered a pig on the Jewish altar to defile the temple. This was in 168 B.C.. The dissertation goes on to speak prophetically about a latter day blasphemer, the "little horn" spoken of in Daniel 7 or the "Man of Sin. This abominable personage, a man who will begin mildly as the peacemaker of Daniel 9:27 will also be possessed by this very same beast demon that possessed Antiochus 2175+ years ago. This "prince who is to come", (referred to in Daniel 9:26), will be the one who will be ushered in during the latter day apostasy of God's covenant people. This is well known in Holy Scripture. Moses spoke about this. The 'covenant with death' is spoken of by the prophet Isaiah in Isa. 28:15-18. And the seven year 'covenant with many' is referred to by the prophet Daniel in Daniel 9:27. By treaty a false messiah will be given access to unprecedented international power. He will proceed to set the political, economic, and religious agenda for "many" nations. This will include national Israel, (currently the royal Jewish House of Judah), and many other nations as well. We can be fairly confident that this international treaty must of necessity involve the key power brokers of the West, the G-7 nations of Western Christendom. Of course from a human perspective it may start out well. Cancellation of national debt, a new world bank and world currency issued out of ten global bio-regions, a clean slate and a fresh start for the nations. Then the clincher; special religious favor given to the big three monotheistic powers, or by then it may be just the big two religions of the Judeo-Christian dominion. This would then realize the Utopian dominionist dreams of the Illuminist Deists. The world leader during those first 3.5 years may be a benign presence in the background. We are left to conclude that the harlot system involving world ecumenism and world materialism will be the rider and ruler during those first 3.5 years. But eventually the harlot will be thrown off her high perch. And the "man behind the curtain" will emerge and take the stage of world history. This final world leader will be no Cromwellian "Lord Protector". The world leader will Satan's bid to install his version of messiah as a humanistic God-man. He will rise up in beastly fashion to take charge. All who stand against him will be terminated with extreme prejudice. The prophet Daniel tells us that he will say unheard of things against the Most High God. This extraordinary turn of events will unfold midway through the 70th Week of Daniel, those final 7 years of this age. At the 3.5 year mark this "prince who is to come" will break the sovereignty sharing covenant, (or treaty), that he made with "many", which must include the prevailing global powers of the Judeo-Christian West. There on the holy temple mount the "beast" will stop the daily sacrifices which at that time will be underway at the rebuilt Temple. There and then he will commit the awful sacrilege, the 'abomination that makes desolate'. So at this midway point through the seven years the Antichrist/Anti-messiah will make a lunge for total global power. And it will be at this point in time that the Beast phase Antichrist will institute his 666 economic system which will of necessity be coupled with a blood covenant marking initiation for worship and testimony of that worship in the Luciferian selfism of ultimate evil. His tyrannical rule will coincide with the Great Tribulation, the final 3.5 years or 1260 days of this age. Antichrist's beast-phase rule also coincides with the travail of the woman, (God's covenant people), during the 1260 days/3.5 years, a time period mentioned twice using different time units and laid out in Revelation 12:6 and 12:14. In this passage John also speaks of the flight of the woman, God's covenant people of the spiritual Seed of Abraham and ensuing the exile of the woman during that very same time frame. There is no question that these people going into exile must be people who will have rejected the offer of participation in the 666 economic system along with its mark and their rejection of the essential worship of Lucifer that goes along with 666. The prophet Daniel spoke about this latter day Antichrist or Anti-messiah who is yet to come. The scripture is here in Daniel 7 as well as in Daniel 9:27 and also in Daniel 12. Jesus confirmed these words of Daniel in His Olivet Discourse and more specifically in Matthew 24:3-31. This "man of sin" will be energized by a hideous power of evil and proceed to commit this awful sacrilege against YHVH-God/God Almighty at the rebuilt Third Temple. The world leader, formerly the peace-making "prince" will have been taken over and possessed by the most hideoulsy evil entity this world will ever see. This man, and we do not know who he is yet, will be demonically possessed by no less than the Beast demon of the Abyss or bottomless pit. This is confirmed by John the Apostle in Revelation 17:8.
and will ascend out of the bottomless pit and go to perdition. when they see the beast that was, and is not, and yet is. John said that his abominable spirit, "was". We also know that a blaspheming desecrating abominably evil spirit became a demon and possessed the Seleucid ruler Antiochus back 168 B.C. during the Greek era. Then John went on to say that the Beast "is not". That is, the evil spirit was not possessing a world ruler in John's time, around 90 A.D during the Roman era. Then John goes on to prophesy that the beast demon will rise up out of the deep like the Kraken of Victorian poetic literature. Breaking loose of the chains of darkness he will rise up to rage against God and men like the hideous giant sea monster of legend. "will ascend out of the Abyss, (or bottomless pit)" and go on to perdition", (the Lake of Fire). From other scriptures we know that the spirit of Anti-Christ/Anti-Messiah haunts this fallen world. But in a time yet to come the key element of this untold unseen wickedness, the beast demon spirit of the Abyss, will be released from restraint and come storming out into world history. Israel's guardian angel Michael, the restrainer of 2Thessalonians 2, is presently holding back the beast spirit of Antichrist. See Daniel 10:21. But at this pivotal future mid-point of thos final seven years Michael will be "taken out of the way" and the beast-demon will be released from the Abyss. The Beast demon of the Bottomless Pit will then rise up to possess the "man of perdition", the future Antichrist. At that point the anti-messiah will be "no more Mr. Nice-Guy". These are the climactic yet hidden spiritual realities that are underlying the history of this world. The hidden powers of wickedness will be revealed for what they truly are as holy history unfolds into the Apocalypse, the threshold of the coming Millennium of Messiah. Our Apostle Paul had this to say about it. [but it is] restrained only until he who restrains is taken out of the way. and bring him to an end by His appearing at His coming. In the book of Revelation the Apostle John said that the Antichrist in his final Beast role would reign for 42 months. See Rev.13:5 Then at the end of those 1260 days, (which is the latter half of the 70th Week/seven of Biblical years), the Beast will have his reign terminated. And we know from the passage above that this will be done at the 1260 day mark, which is thirty days short of the 1290 days that mark the terminus of this present evil age and the return of Messiah. STRICTLY SPEAKING THE SECOND TEMPLE WAS NOT DESTROYED BY ORDER OF ROME. NOR WAS IT DESTROYED BY THE ROMAN ARMY OR BY ORDER OF GENERAL TITUS IN 70 A.D. IT'S DESTRUCTION CAME AS A WANTON REBELLIOUS ACT BY A DEVILISH ANARCHISTIC MOB. RESULT OF A DEMOCRATIC IMPULSE TO COMMIT VANDALISM AND SACRILEGE. So as we read John's account of the Revelation of Christ in Revelation 17:8 we see that at that time, that is during the first Century, this Anti-Messiah Beast spirit who hates and despises the anointed holy things of the God of Israel was not on the scene. John, (reporting from Roman times), said that the beast demon of the Abyss "is not". So the hideous thing was not possessing a ruler in John's time (that is Roman times). Josephus brings us a confirming report concerning this. In fact the Jewish historian writes that the Roman General Titus had actually made an agreement with his other generals before the campaign against Jerusalem was even engaged. All of the generals had agreed that the Temple would be spared. The Roman sovereignty and Roman leadership had acted nobly in deciding to preserve the Temple. Remember that the Medo-Persian superpower under Cyrus had similarly been pleased to see the Hebrew Temple standing. But the history Josephus brings us tells us even more. General Titus and loyal soldiers of the Roman military actually took up arms to try to save the Temple. They actually drew swords against their own men to protect the Temple in a vain attempt to turn back the onrushing flood of depraved humanity. A frenzied mob of soldiers and others were rushing in against them to set fire to the Temple. The mob prevailed and the Temple was soon going up in flames. 600 years before this the prophet Daniel had prophesied that this very thing would happen. He said that it would be "the people" who destroyed the Temple. and shall have nothing [and no one] belonging to [and defending] Him. The angel told Daniel that the destruction would come not by edict or by an executive order of an imperial ruler. This outrage against the Holy Temple would be committed by a "people", a "people" who belonged to a coming prince, a "prince who is to come". The destruction of the Temple would come as an impulsive act springing up from the grassroots of humanity, a destructive sacrilegious action waged by a democratic or anarchistic mob. Daniel was told specifically that "the people of the prince who is to come", (that is the people who belonged to "the prince" who was to come or were of the spiritual ilk of the coming latter day Beast Antichrist), would be the ones who would destroy the temple. The prophet Daniel received this information over 600 years earlier, back in 538 B.C. in the first year of Darius in the Medo-Persian era. So this Roman history of the destruction of the Second Temple coming as it did in 70 A.D. bears out the remarkable accuracy of his prophecy. A profane and godless rabble were hovered over by the spirit of Antichrist or anti-Messiah which stirs up a seething hatred of the Messiah, the One who will come to judge the beast demon of the Abyss and the entire wicked angelic host at the close of this age. The unbridled mob gathering before that Holy Place was driven into a veritable frenzy on that awful day. They stormed the Temple and set fire to it. Then they began tearing down the entire edifice stone by stone. It was the people who carried out this total destruction of the Temple. And they razed to the ground. Part of the reason they did this was to recover the gold that had melted and flowed down into the foundations. Jesus in Matthew 24 had predicted this very thing. In 32 A.D. during passion week He said that the temple would be destroyed and that "not one stone would stand upon another". See Luke 21:6-7. Daniel's prophecy of "a people" destroying the holy temple was fulfilled precisely in 70 A.D.. The "people of the prince who is to come" destroyed the temple. Remember this was a full 600+ years after Daniel had received God's specific Word on this from the angel Gabriel. The image below is from "Ridpath's History of the World". It is an accurate picture of what actually happened on that dreadful day. Josephus, the Jewish historian embedded with the Roman Army is our authoritative source of information here. 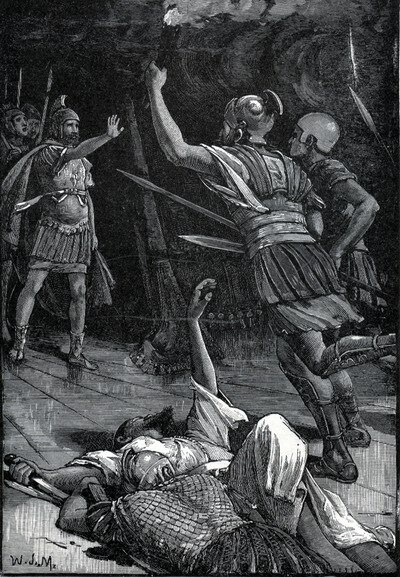 He reported that the Roman General Titus and soldiers loyal to him stood in the way and tried to prevent the raging mob from rushing in and setting fire to the Temple. This old lithograph is taken from Volume III of 'Ridpath's History of the World' published in 1910. So as we study Daniel 9:26 we realize that the spirit that possessed the mob that destroyed the Jewish Temple specifically belongs to the 666 Beast spirit who will rise up in the latter days and go to perdition or the Lake of Fire. That same Beast spirit, the demon from the Abyss has actually possessed a ruler in times past. He possessed Antiochus Epiphanes back in the former Greek era. This same beast demon will be released from the Abyss when the Restrainer (2Thes. 2) is 'taken out of the way' in a future time period. This abominable spirit will then rise up and possess the future Antichrist, or as the prophet Daniel calls him, the "prince who is to come". So this action by General Titus and loyal members of his army in trying to prevent the destruction of the Temple is fine point of history but a very telling one. The destruction was not essentially a Roman action at all. It was motivated by very evil renegade elements within the Roman Army and others who gathered there as well. These men and women, wittingly or unwittingly, were pawns of the most evil powers this world has ever seen or will ever see. They gathered as an unruly mob, raging against the things of God. Then they set fire to the Temple. These people were not just "out of line" or "crazy". This is an accommodation to evil, a "cloaking" of the truth, and a cop-out. Let us face the facts here. History bears the record that the burning of the temple was not planned by the Roman military. And the prophet Daniel clearly tells us that these were not just "Roman soldiers" who destroyed the temple. These people were in a special category. God's Word states that they belonged to 'the prince who is to come'. This is an unmistakable reference to the Beast, the Anti-Messiah or Antichrist who is to come. These deluded godless mobsters may not have known what they were doing. But they were caught up and driven by destroying spirits of the most wicked kind. Human anti-Semites may be mindless pawns who do not know what they do or why they do it. But the abominable evil spirit of Antichrist and his entourage of wicked spirits are driving this Anti-Semitism. And they know very well what they are doing. The spirit of anti-Messiah/anti-Christ hates and loathes the Throne of David. And the hideous thing has an agenda. It wants to stop the witness that holy history will call for to herald the coming of Messiah. And why do those who drive godless men and women to desecrate the holy things of God hate the Holy Place and hate the Holy People of both houses of Israel? And why do they instigate the deadly ongoing persecutions against the Congregation YHVH-God has called to Himself? The answer is simple. It is because they all bear witness to the coming Messiah who will sit upon the Throne of David. It is upon the Throne of David that the future Messiah, the Son of David, David's greater Son, will sit in Judgment on the Day of the Lord. The principalities and powers, the angelic rulers over humanistic hierarchies, the dark angels who pull the strings of men fear and loathe this coming day. The know full what it means. They will be facing their own doom. And when Messiah comes their rule will be terminated. So there is a conspiracy in this world against the coming of Messiah. King David wrote a song about it. You can see it here in Psalm 2. But the conspirators, angelic and human, who are working on behalf of the coming anti-Messiah/Antichrist will come to their appointed end in eternal torment. When Messiah comes in Judgment He will unseat and cast down the angelic principalities and powers. And the hierarchies, both angelic and human, who bear rule in this present evil age will be terminated. The destruction of the Second Temple was an awful thing. But God's people had allowed themselves to be compromised by evil. They had turned to other gods and neglected the true worship and service due to the Holy One of Israel. So this destruction was prophesied to happen. The sacrilege and the destruction was driven by hidden occult powers gathered around the most wicked spirit this world will ever see. This creeping wickedness operating down at the grassroots of humanity had an agenda. It was out to desecrate the holy things of God. This mob desecration and destruction of the Second Temple came as a direct fulfillment of Daniel's prophecy in Daniel 9:26. Daniel was given the message by the angel Gabriel. He then wrote it into Holy Scripture. This was way back during the first year of Medo-Persian rule which was initiated by Darius the Mede in 538 B.C. while Cyrus was off conquering Assyria and consolidating the combined kingdom. Here is the gist of that message. "The people of the prince who is to come will destroy the temple". God's Word clearly and specifically states that the people of the prince who is to come will destroy and desecrate the Temple. In their wanton irreverence they demonstrate that they are the spiritual ilk of the future Beast Antichrist. This Man of Sin who is to come will assume global rule in the latter days. He will be the ultimate executor of this future mid-70th Week blasphemy against the Holy Place. So these godless type of people have always been around. And they are amongst us today, awaiting the day when they can give their allegiance to the Antichrist in his ultimate Beast role. These people are always the perpetrators of blasphemy, desecration, and destruction of anything that is holy. They are the ones who rage against our returning Jewish Messiah and seek to bring down the holy things of the Judeo-Christian God. These rebels against God's righteous rule loathe and despise the throne of David. And they profane His holy priestly ministry in the Gospel. Such people have always been with us. And they are still with us today. Only the return of Messiah and the sending forth of the angels of wrath in the grim reaping at the harvest after that final Day of Atonement or Day of Reckoning at the end of this age will see these tares plucked up and removed from planet earth forever. There and then in the Apocalypse they will will meet their doom. They will be plucked off the earth kicking and screaming by their destroying angels, the fearsome grim reapers featured in the tattoo parlors. They will be bundled up for the fires of perdition right at the opening of the Day of the Lord. You can read what Jesus/Yeshua said about this in Mat.13:25-30. THE DESIRE TO REBUILD THE TEMPLE. Since the destruction of the Temple in 70 A.D. there has been a deep desire among many observant Jews both out in the Diaspora and back in Eretz Israel to rebuild the Jewish Temple. At the present time the rebuilding of the Jewish Temple is quite impossible from a political perspective. The Temple Mount area is under rather strict Islamic control. They give the permission for all and everything that goes on up on this the most prized real estate on the planet. But the prophetic scriptures indicate that the political equation will change at some point. And the Jewish Third Temple will indeed be rebuilt. We can only assume that those sad conditions we see and take for granted today will change quite dramatically as an outcome of some future history. It will of necessity have to be a major upheaval and a sudden turnaround in the political realities on the ground. At some point there will be a new peace on the Temple Mount. What power will have come onto the scene to change the longstanding 'status quo' here? What national or international entity will have done this and what will have happened? Well at present we do not know exactly. But one thing we can say with some assurance. At some future time the Temple Mount in Jerusalem will be taken out of Islamic control and secured for Israel. A very significant Middle East peace will be confirmed and guaranteed. This rebuilding of the Temple will at some future time be permitted by a major world power, superpower, or international power. And that power will most certainly not be an Islamic one. We can surmise that this peace covenant will be brokered by someone who emerges on the scene after western powers have taken on the Islamic powers, flown at them with great fury, and brought them down. ISLAMIC AUTHORITY UPON THE TEMPLE MOUNT IS THE PRESENT REALITY. MUSLIM PRINCIPALITIES AND POWERS STRONGLY FORBID THE REBUILDING OF THE TEMPLE. BUT STARTLING FUTURE EVENTS WILL OVERTURN THE STATUS QUO AND END THE PRESENT IMPASSE. A FUTURE WAR WILL BRING IN A FUTURE PEACE. AND A NEW AUTHORITY ON THE TEMPLE MOUNT WILL ISSUE THE LONG AWAITED PERMIT FOR THE REBUILDING OF THE THIRD TEMPLE. So how will the peace necessary to allow this rebuilding of the Jewish Temple be secured? Will it come by shuttle negotiation by an American Secretary of State as they work to find common ground between Israel and Hamas and/or the PLO? Or is there no common ground to be had? Will that peace in fact come after a future war? Will the radical fundamentalist Islamic powers currently ruling the Temple Mount be defeated by a combined Judeo-Christian (anti-terror) alliance? That would seem to be the pattern and the direction that both world history and holy history is headed. Every Middle East war sees Israel get closer and closer to the Temple Mount. The shofar is blown by Rabbi Goren at the Western Wall on June 7th, 1967 during the six Day War declaring the liberation of Jerusalem. The Israelis secured the Old City as far as the western wall. 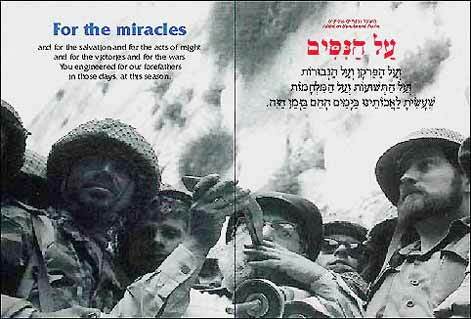 During the 1967 Six Day War the Israeli Army took Jerusalem. They made it as far as the Western Wall. And that is where they stopped. This was a pivotal moment in holy history. At that awesome moment they paused and Rabbi Goren blew the shofar. The Temple Mount was just a few meters away. They were so close. How about next time? Will the Israelis make it all the way to the top? Will Jewish forces end up capturing the entire Temple Mount? If the pattern continues it is highly likely that they will. If they do then another question arises. Just who will then step in as peacemaker? Who will step in and divide the spoils? And who will broker the deal for the ensuing peace? Clearly the Jewish Temple rebuilding project needs a secured pro-Israel peace on the Temple Mount. They must have this even to lay the foundation stone for the future Temple. The world community at large, is crying out for "peace and security" in the world. Nuclear disarmament is part and parcel of that. Here is why this future peace is so crucial to the unfolding of Bible prophecy. Peace on the Temple Mount will bring peace to Jerusalem. Peace in Jerusalem will bring peace to the the Middle east. Peace in the Middle east will bring peace to the world. So somewhere down the line that future peace, albeit an imperfect compromising one, will surely come. And a third Jewish Temple will be built. AN HISTORIC PEACE IN THE MIDDLE EAST WILL SURELY COME. IT WILL NOT COME IN BY A COLD TREATY BROKERED BY DIPLOMATS. VERY DESTRUCTIVE WAR IN THE MIDDLE EAST. So the question arises. Just how will this future blockbuster Middle East peace be brokered? It seems that this coming Peace Treaty will be a very solid one. It will be the completion and ratification of the very same "Peace Process" or "Roadmap to Peace" we have been seeing develop in recent years. Quite clearly the peace required for the rebuilding of the Jewish Temple will finally be established in the city. And more particularly that peace will be secured up on the Temple Mount. This peace will need to be guaranteed by a world power that has some clout. Quite clearly this peacemaking person backed by world power will at least ostensibly present themself as being pro-Israel. Daniel tells us that a seven year covenant involving significant compromise, (even a giveaway of the sovereign and holy land of Eretz Israel), will be confirmed. The seven year treaty will be brokered by and with a certain "prince". How will this have happened? Well this is an interesting question. It is entirely possible that this future peace treaty will be brokered in the aftermath of a major future Middle East conflict. This coming war may turn out to be be a very destructive one. Could it be the war that the prophet Isaiah spoke about in Isaiah 17, the war that sees the destruction of Damascus? History demonstrates a recurring pattern. Great treaties do not tend to happen just by diplomacy and in peacetime. A significant peace cannot be foisted upon unwilling contestants merely by the under the table monetary coaxing we see on White House lawns and rose gardens under the present day Pax Americana. Superpowers and their international bankers can do very little during times of peace. And much of what is showcased in the way of "peace agreements" during peace amount to little more than political theater. The real test of a true peace is one that sees subsequent trade between the two parties. But usually this doesn't happen. We saw the handshake before the superpower. And the treaty paper was signed. But were the goods of peaceful trade crossing the border and delivered as promised? Did the loan guarantees get spent for peaceful purposes? Or did the money just go to purchase more missiles and guns? We have seen the handshakes and the political theater between Israel and the PLO. But is there peaceful trade between Israel and the Gaza Strip today? How about between Israel and Egypt? Israel is forced to sit at a table with a neo-Philistine terrorist PLO leader. (Yassar Arafat was really an Egyptian. But that fact was kept hidden for the sake of building up this fable of "Palestine".) The so-called Palestine Authority represents a rambunctious people who have been evicted from Jordan and are not permitted entry into other Arab or Islamic countries. Many of them have no interest in living peacefully and taking care of their families with the huge monetary handouts they are given. And their liberal minded supporters, including many governmental officials and ecumenical church leaders in the west, seem to overlook the bloody bombings of Israeli buses and cafes. They are fully aware that the Palestinians they dote over cannot settle down and be peaceful. Liberal churchmen are the strangest of all. They pretend to worship and lift up "God", which they should readily identify as the God of Israel. He sent His Son, the Jewish Messiah, to be the Savior of the World. They are supposedly all in favor of "peace". But apparently it doesn't bother them that the Palestinians they support unconditionally commit random acts of unkindness, even bloody mayhem. And in their ecumenical roundtables they secretly and smilingly assent to the push to get Israel to give away Holy Land, well knowing that their nibbling away at Eretz Israel leaves the present Jewish state vulnerable to attack and total destruction. The Palestinians at present are not a sovereign entity at all. They never have been. They have no history, no coinage, no nothing. Under the Romans the Jewish nation were defeated in 70 A.D. and scattered in the Diaspora. The land that Israel left behind was renamed. It was put under the spiritual covering of the Philistines, the nation that had been Israel's worst enemy. The Romans renamed Israel calling it "Palestine" for the Phillistines. Yes, the spiritual principality and power over the PLO as it tries to occupy the Holy Land is the same as the Philistine nation that lived on Israel's coast and fought against Israel in former times 3,000 years ago. Yes, the Romans destroyed the Temple in 70 A.D. and drove the Jewish nation out of the land completely. Then they re-named the Holy Land "Palestine" for the Philistines. The British continued the Roman tradition. They too called the land "Palestine". But Palestine was never a nation. It was a byword. It was a term of derision by the Romans against Israel. There have never been any Palestinian kings. There has never been a Palestinian currency. There are no Palestinian archaeological digs. Nor do chronicles exist of any kings or any significant or noteworthy Palestinian history. The reason for this should be abundantly clear. After the Romans scattered Judah the land was an empty wilderness. Some nomads were there to be sure. And the caravans of Arab traders passed through. But there never was a sovereign Palestinian nation. The very idea of a "Palestinian State" is a gigantic political facade and a hoax. Let us look at the facts. For 1800 years Eretz Israel was a desolate wasteland with just a few trees and few inhabitants. "Palestinians", so-called, have nomads and passers through the Land. Since the Jewish State was formed in 1948 they have come to work in Israel since its resettlement. They have been given human rights and perhaps even some squatters rights since they have come to live in the land. But the land was promised to Abraham 4,000 years ago in the Abrahamic covenant. 3500 years ago under Joshua the Holy Land was conquered, except for Philistia on the coast, and parceled out to the 12 tribes of Israel. But global humanists, along with those who do not like the God of Israel, champion Palestinian and Islamic rights to the land discount this claim. And Palestinian terrorists, and there are many of them, are not at all interested in peace and squander the money Western do-gooders give them. Many of them, not all, live for one reason, to destroy Israel. History is going to have to settle this ownership issue. And Christians with a Biblical world view know how it will end. 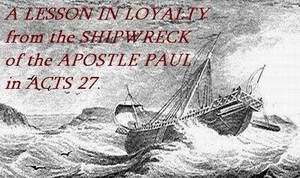 It will end with a showdown, a time of tribulation, trial and travail, and a glorious reunion and restoration of God's (single) Elect as a royal priesthood and a holy nation, even the Commonwealth of Israel our Apostle Paul spoke about in Ephesians 2:12-13.. In the meantime all terrorists must be kept in check by the superpower who is called by God to keep the peace in righteousness and mercy in this evil world. Of course the terrorists against God's land and against his people are merely spiritual pawns in all this. Like Nazi skinheads and KKK anti-Semites terrorists don't really know why they commit these seemingly senseless bloody acts of violence. Who commissioned them to do this? And why? They can't tell you. But the evil angels that pull their strings to bomb and to maim innocent civilians know precisely what they are doing and why they are doing it. The evil principalities and powers, the angelic rulers over the hierarchies of men, are a conglomeration of rulers in rebellion against God. But they are all in agreement over one thing. These angelic principalities and powers hate the coming throne of David! Saints, this is the very essence of Anti-Semitism! The reason for this is very obvious to those who know the God of the Bible. The Throne of David is the seat of Israel's future Messiah. The Throne of David is where He will sit in judgment in times to come. The angelic rulers know what will happen when Messiah comes back. And they don't like it one bit. They know that it will be curtains for them! There never has been peace between God's covenant people and these dark angelic powers. And there never will be. To believe otherwise is an impossible dream without any Biblical foundation whatsoever. The peace conferences are showcased at best by starry-eyed Pollyanna humanists and at worst by people with a hidden anti-Messianic agenda. The two parties, Israel and the so-called Palestinians will never see eye to eye. Nor can we expect them to sit down at table in true lasting peace. They are anathema to each other even as Jacob and Esau. One of them must be spiritually subdued, or defeated in war, or both. But nevertheless, what have we seen time and time again? Two parties, one peaceful, the other terrorist, are there at the so-called "Peace Conference". There is no real peace between them, nor can there be. To believe that peace is possible by carving up and selling God's Holy Land is to push a delusional and reckless agenda on a Middle East that is a tinderbox waiting for a match. Of course there is an unseen money story in these Middle East Peace conferences, something that is not reported on. There at the showcased "peace conference" there are billions of dollars in loan guarantees for Israel and party rewards for "not giving away the farm" changing hands under the table. And for the profane worldly religious and secular powers and the Islamic powers with interests in the so-called "Palestinian" party there is the promise of a slice of God's country. There were deals to be made, on the table, off the table, and under the table. That was why the two parties really came for the so-called "Middle East Peace Talks". It had nothing to do with peace at all. The two parties have been "economically encouraged" to "make peace". But they cannot really deliver. They can only make a show of peace. The pattern is always the same. The two parties are flown in to meet together at the camp meeting. Then, after a supposed "breakthrough in negotiations" they are hustled off to appear before the media microphones and cameras. They are obviously prepped for the occasion as they proceed to shake hands and smile for the photo-op. But it is a sham. The Peace of Jerusalem is a holy reality. It cannot be brokered in such a cheap way using the ways of Mammon. The Peace of Jerusalem will only come when Israel's Prince of Peace comes into the hearts of His covenant people. This is prophesied to happen in an increasingly wonderful way to those who are responding to God's call. Even now many around the world are inviting the "Prince of Peace", Jesus Christ, Yeshua Hamashiach, to come and dwell with them and to take up residence in their hearts. Indeed, the hearts of men will be His throne. And here on earth, on a special time to come, Israel's Messiah will certainly return to Jerusalem to enter into His Holy City. So significant peace agreements that have any real meaning do not come in times of peace. Great and significant resolutions usually come at the end of great conflicts. The League of Nations was a significant step toward real peace, (while it lasted). But it was brokered at the conclusion of World War 1 and the loss of 20 million lives. The League only lasted a few short years. The United Nations was the next fairly significant international agreement. It came out of World War 2 and after the sacrifice of 50 million lives. The principle from history is simply this. Big peace accords do not come by diplomacy. They usually follow big wars. Enter then the peacemaker, and the one who "confirms" the "Road Map to Peace". Enter the "prince" of Daniel 9:26-27. Just who will this person turn out to be? THE DESTRUCTION OF DAMASCUS WAS PROPHESIED BY ISAIAH. THAT ALLOWS THE BUILDING OF THE THIRD TEMPLE. Isaiah prophesied the coming destruction of Damascus. How and where might this future war take place? We are familiar with the threats by the current Iranian/Persian president to destroy Israel. And we know that Iran is working towards building nuclear weapons. Israel has also recently expressed concern that terrorist cells of Hamas and Hezbollah are holed up in the nearby city of Damascus in southern Syria. It is very close to Jerusalem. Damascus is the oldest city in the world. It has a long history going back 4,000 years to the time of Abraham. See this map. Damascus has never been destroyed in war. But there is a prophecy awaiting fulfillment that very clearly predicts the destruction of Damascus. The prophet Isaiah spoke of this. He said that the city of Damascus would become a "heap of rubble". (See Isaiah chapter 17). That being the case, we might do well to keep an eye on this developing situation of terrorist cells operating out of Damascus in southern Syria. Syria has also taken delivery of sophisticated Russian GPS guided missiles. Faithful hearts and realistic minds in Israel know better. They will not be hoodwinked and blindsided by all this talk of "Peace, peace, when there is no peace". They are preparing to defend God's Holy Land, and there will be no Masada event next time. Because as we approach the end of this present era the Lion of Judah will roar. There is a conspiracy of wicked angels and deluded men against little Israel. When the powers cannot defeat Israel in war they will try the hidden agenda. They will try to weaken her morally by compromise in the Fabian way of Balaam. So there is an overt and covert raging of nations against the coming of Messiah. King David wrote a song about this vain humanistic rebellion against Messiah/Christ 3,000 years ago, Oh yes, Antisemitism at its root is the spirit of Antichrist. King David's song told of this conspiracy against David's greater Son, our coming Messiah. We can read it here in Psalm 2. One thing we can say with complete assurance. If the Jewish Temple is to be built then the balance of power will need to be changed, and changed in a dramatic sort of way. Something big will have to happen to break the present Islamic hold on the Temple Mount. The status quo in Jerusalem with respect to how it is divided up was established a long time ago. The current divisions of Jerusalem into Moslem, Jewish, Christian, and Armenian sectors was set forth by the Ottoman Turks half a millennium ago. Indeed this decreed sectioning of the Holy City was where the term "status quo" came into our language. Suleiman the Magnificent divided the Old City of Jerusalem into its various quarters. Then he capped off all his efforts by bricking closed the Eastern Gate. The sultan had heard that this was the gate through which Israel's Messiah had come through and would come through again upon His return. So his masons went to work to block the passage. The principalities and powers, angelic and human, were acting true to form. They were trying to prevent the return of the Jewish Messiah. The principalities and powers are in rebellion against God. They hate the coming Throne of David upon which the future Messiah will sit. This is the real reason, the true origin of anti-Semitism. In its true essence anti-Semitism is anti-Messiah and anti-Christ. It may track down the lines of DNA and down the bloodlines of the faithful. But the story of the Seed of Abraham in the wider Commonwealth of Israel is far greater than that. Millions of Jews and millions of Evangelical Christians have died at the hands of the very same dark angels who bear rule among the worldly powers. Six million Jews died during the Holocaust. And every day across this world 500 Evangelical Christians die for the faith in the Jewish Messiah. So at its root and in the depths of its evil heart the fear, the hatred, and loathing of the coming Throne of David and the hatred against the coming Messiah who will rule this world from Zion is a spiritual reality. Anti-Semitism is not primarily a racial thing at all. So here we stand, at the threshold of the Millennium of Messiah. And this is our present situation. The Temple Mount is under Islamic control. And unless the current political 'status quo' is dramatically and decisively overturned there will be no change. There will be no peace on the Temple Mount. And there will be no rebuilding of the Jewish Temple. 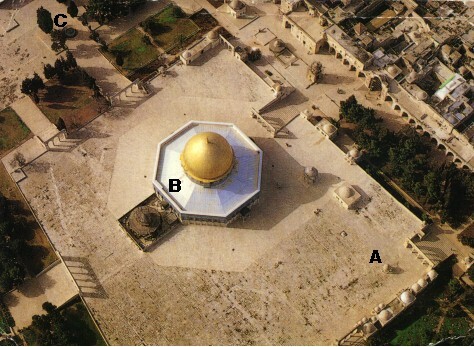 The small cupola marked "A" marks the location of the Holy of Holies. The Third Temple could be built over this and leave room for the Dome of the Rock. This would be a compromise. Indeed compromise will mark the character of the final seven years of this age before the return of Messiah. As we consider the rebuilding of the Temple there is one more important question that must be addressed. Just where on the Temple Mount will the future Jewish Temple be built? Will the foundations be laid right in the middle of the Temple Mount as many suppose? This would necessitate the removal or destruction of the Dome of the Rock. Of course this would be an earthshaking turn of events. The Dome is a revered Islamic site. Will the Dome of the Rock be destroyed? And is its removal even necessary? Just where did the original temple stand? Was it really in the center as we see in the paintings? Or was it situated to the north of the present location of the Dome of the Rock? Some Jewish authorities on the subject, notably Asher Kaufmann are saying precisely this. This is very interesting. It opens up the very real possibility that the Third Jewish Temple will be constructed on the north side of the Mount. The small cupola marked "A" is called "the dome of the Spirits". It is said to mark the point of the holy of holies in the former temple. Could the Temple be rebuilt next to the Islamic Dome of the Rock? Could Israel's future Temple and its worshipers peacefully coexist with the Islamic Dome and their worshipers? This would be very politically favorable to world peace. If such a plan was acted upon then the Temple Mount would look something like what we see in the picture up above. As we have previously stated, it seems that the Jewish Temple can only be rebuilt under the covering of an all encompassing world peace. This peace will most certainly involve Israel and her Islamic neighbors. Such a peace is something that we have not seen yet. Quite obviously it is out there in the future. Because all attempts by the Jewish 'Temple Mount Faithful' to place a foundation stone for the temple on the temple mount have incited Islamic rioting. When Ariel Sharon presumptuously decided to take a stroll on the Temple Mount some years ago the result was bloody mayhem. There was a huge hue and cry throughout the Islamic world. In fact it started off a historic wave of terrorism that came to be known as "the Intifada". BOTH A JEWISH TEMPLE AND AN ISLAMIC DOME SIDE BY SIDE? Let us look further at the details concerning the placement of that future temple on the Temple Mount. We have evidence that the former Jewish temple was built north of the site where the Dome of the Rock presently site. The Dome of the Spirits, a small cupola, is said to be the location of the Holy of Holies. This is well to the north and in direct alignment with the Eastern Gate. This fact along with some mounting archaeological evidence would seem to indicate that the former (second) Temple was situated not in the center of the temple mount at all but rather on the north side of temple mount. This is directly opposite the Eastern Gate. This layout has been set forth by noted scholar Asher Kauffman. This alignment of the future Jewish Temple with the Eastern Gate would only be appropriate. 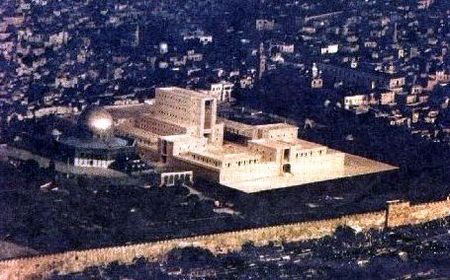 The architectural layout of the temple would surely have been to allow the Messiah to come through the eastern gate and go straight ahead into the Holy City. He would not be doing any turning left and then right or any "jigs". He would enter the city and go straight ahead and up into the Temple. Here is another issue. If the temple was in the center of the Temple Mount then Messiah coming through the Eastern Gate would have to turn left upon entering the city. Turning left in Biblical symbology is turning to evil. It would certainly not be good form for a returning Messiah to do any such thing. Such a zig zag route is, in fact, unthinkable. Surely Zerubbabel, (and Solomon before him), were mindful of this when the temple was designed. It was a magnificent Temple laid out for a coming Messiah who was King of Kings. And we can be sure that the whole temple mount area was meticulously and tastefully laid out. YHVH God Himself was the true divine Architect here. He guided King David as the king set forth the plans and the materials. David had a heart for this but because of bloodshed was not permitted to build it himself. But he made preparations for his son Solomon to build the temple. We can well assume that the former two temples were faithfully constructed by the builders according to the blueprint of a holy and divine order. This would only be in keeping with the beauty of form our Messiah most assuredly deserves. As it happens, this northern site is being looked at by one of several Jewish groups who are working towards the rebuilding of the Hebrew Temple. The last temple, the second temple built by Zerubbabel and embellished by Herod was destroyed by the Romans under Titus in 70 A.D..
As we look now at the present situation we see that the Dome of the Rock occupies the center of the Temple Mount. The future third temple could therefore be rebuilt to the north of the Dome. It would be on the same site as the former temple. There would be room to provide an acceptable easement between the two buildings. There would, in fact, be a clearance of 150 feet. This would allow the Dome to actually co-exist with the Third Jewish Temple provided the Temple is rebuilt straight across from the Eastern Gate. According to scholars such as Asher Kauffman his is in fact the archaeologically correct position. To the current international political players this peaceful coexistence of and Islamic Dome and a Jewish Temple would be quite acceptable as well. It would not be the architecture of the ultimate Messianic dominion in holiness expected by the Jewish and Christian people of the Book. But the powers who rule in this present world would probably favor it. Such an arrangement would be "politically correct". The good news in all this, from the perspective of an interim pre-Messianic or non-Messianic world peace, is that to build a third temple there would be no necessity to destroy the Islamic shrine, the Dome of the Rock. It could be constructed right next door to the Dome of the Rock. THE TEMPLE MOUNT SHOWCASED THE BLOOD COVENANT BETWEEN YHVH-GOD AND MAN. THE OFFERING OF THE SEED OF ABRAHAM FOR SACRIFICE WAS THE KEY. YHVH-GOD WOULD ALSO ACT TO PROVIDE HIMSELF, A LAMB. THAT SACRIFICE LAMB WOULD ALSO COME FROM THE LOINS OF ABRAHAM. THE BLOOD OF ATONEMENT WAS THE ULTIMATE AND THE ONLY ACCEPTABLE SACRIFICE FOR SIN. AND PEACE ON EARTH AMONG MEN OF GOOD WILL. The temple mount is one of the most holy and important places on the planet. The Holy Place marks the place where Abraham sealed the covenant with YHVH-God. As such it is a key place to celebrate true and genuine world peace. This is why the powers of darkness have contested this place above all other places on earth. Up on the Temple Mount area is the place where Abraham offered up his son, Isaac, (or was prepared to do that). This was the place of Abraham's total blood covenant commitment of himself and his family to YHVH-God. It also marks the place of YHVH's provision of a sacrifice lamb. If we think about it for a moment the Holy Place in the Temple of YHVH is not just built on Abraham's willingness to sacrifice his son. This act of faith by Abraham, YHVH-God's covenant partner, was essential. Abraham's willingness to act in faith believing that God would resurrect his son from the dead was indeed important. This was man's or Abraham's part of the Eternal Covenant. But Abraham's willingness to surrender up his beloved son Isaac was a mirror, a demonstration of what God was going to do on His side of the covenant. God's part of the Covenant was demonstrated on the temple mount as well. Abraham said that "God would provide Himself a lamb". When Abraham looked up and saw a lamb caught by the thorns around his head. In the manner of covenants Abraham's part in offering up his son Isaac was vital. In this act of obedience Abraham showed a willingness to enter into a blood covenant with God. It was essential for Abraham, as God's blood covenant partner, to be willing to sacrifice his son. Because in the Redemption plan of the ages YHVH-God was going to offer up His Son too. So here, acted out on the Temple Mount was the basis for true and lasting peace. And it was showcased 4,000 years ago. YHVH/God was Abraham's covenant partner. And He was taking the initiative in the covenant. He stated that "He would provide Himself a Lamb". YHVH God would offer up His only son from out of His own divine Spirit and essence. His shed blood would provide the final atoning Sacrifice. The Lamb of God would take away the sins of the world. The suffering Church understands these things. 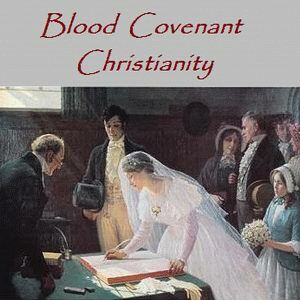 But these issues of blood covenant are not well understood by modern and post-modern Christians in the west today. They live in a material world of merchants and lawyers. The covenants they deal in are merely low grade contracts, deals that are made and broken whenever one party finds it convenient to do so. Western Evangelicals, for the most part, do not understand the true blood covenant nature of their faith. Nor do they appreciate the necessity of the end-time blood covenant witness. They do not understand blood covenant Christianity as it relates to the New Covenant. A blood covenant relationship in the lovingkindness of YHVH-God , and not the legal intricacies of contract law, is the main issue here. The Law and righteousness of YHVH-God in the Torah and Tanakh have always been a matter of the heart, just as Jeremiah stated here in Jeremiah 31:31-33. Sinai was not merely a governmental judicial proceeding or just an assembly for a formality of state. The children of Israel at Sinai were gathered as individuals in a Congregation, even a a "camp meeting" before YHVH-God. Unfortunately, due to idolatry and rebellion, it did not end up that way. The Law was given, and the nation of Israel established. But the children of Israel were slow to respond to God in their hearts. So they were delayed in their entry into the Promised Land. The New Covenant is and expansion of the Old Covenant. The same law and Torah is there. But it has now been taken up to the next level. The New covenant is a personal matter of the heart. God's covenant people only really succeed in obeying God when they invite him into their lives and come to love Him. This relationship with YHVH-God in Agape love is the true essence of the blood covenant relationship that Abraham knew, experienced, and walked in. This personal walk with God is the basis for the relationship Christian and Messianic believers presently have with the Seed of Abraham, the promised Son of David, Jesus Christ/Yeshua Hamashiach who is Emmanuel, "God with us". He is the Living Word, the indwelling Torah. We download Him into our hearts and lives and come to be "born again" into new creatures. And as YHVH-God's Law is written on the tables of our heart He energizes us to bring forth the works of righteousness in our lives. This is something we ourselves could never do. When He is invited in our Messiah as King sits upon the throne of our heart and as High Priest ministers at the altar of our hearts. Both offices of Melchizedek are there inside us with the indwelling Messiah. This is how He performs those hidden miracles in human hearts. He Himself is the engine of change and sanctification in our lives. When we repent of our sin and selfism and invite Him in He begins to change us from the inside out. The binding of Isaac by our patriarch Abraham and his willingness to sacrifice His only true son was a crucial part of the Eternal Covenant. It was a reflection of Abraham's faith and his blood covenant commitment in the lovingkindness of YHVH-God. This willingness to sacrifice shown by Abraham, would be demonstrated in the character and witness of the myriad company of Abraham that would follow him. This act of total commitment and "unto death do us part" is the basis of the Eternal Covenant in the Gospel. It goes far beyond humanistic deals, contracts, compromises and the idolatry and rebellion of pagan witchcraft and the antinomian religion we see so much of nowadays. The Abrahamic covenant is in the true Gospel. It takes us far beyond the cheap religion that compromises in the way of Balaam and makes deals with the powers of this world. The Abrahamic Covenant, first seen on the Temple Mount, was the basis of the greater things that YHVH-God was going to do for Israel and for all mankind in future times. We serve a God who is not slack concerning His promises. By faith Abraham said that "God would provide Himself a Lamb" for sacrifice. Abraham heard the voice from heaven which stayed his hand. Then he turned to see the sacrifice lamb that God had provided. He saw the ram caught by his horns. The thorns were wrapped around the head of the lamb. The Seed of Abraham, Isaac, and Jacob was preserved. And the seed of Abraham, Isaac, and Jacob, even a melo-hagoyim, a multitude of nations would be saved. 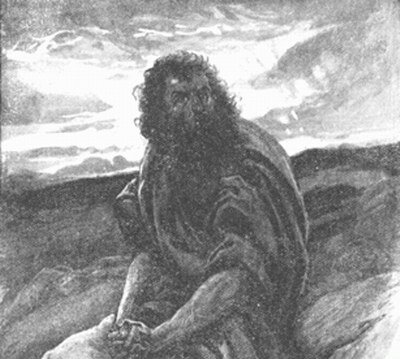 Abraham then unbound and released his son. The faith of Abraham in total surrender to the will of God is the essential blood covenant reality here. Total surrender to YHVH-God is still the basis for salvation in all of Abraham's family today. So right there, on the Temple Mount, in the divine typology, was a picture of a promised future Sacrifice Lamb. If the future Jewish Temple is to be rebuilt it will showcase Israel's Sacrifice Lamb. This is the first thing that confronts the visitor to the Temple, or the Tabernacle that preceded it. They see the brazen altar. And they see the lamb of sacrifice upon that altar. This is a powerful demonstration of the seriousness of God's Law and the penalty, paid in blood, for transgressing that Law. Israel's promised Son will be lifted up in the hearts of men in times to come. He will return to His Temple and will be seen by all mankind. The Holy One of Israel will be a 'Light to the Gentiles'. (Isa.42:6, 49:6, & 60:3) Surely the Anointed One, the Messiah, is that Sacrifice Lamb. In His earlier priestly role we saw Messiah fulfill all three of the earlier spring feasts of the Seven Feasts of Israel. It was on Passover that we saw Him sacrificed as the Lamb of God who takes away the sins of the world. He was also the Suffering Servant Isaiah spoke about. (See Isaiah 53) He is our true High Priest who brings the blood of a better sacrifice. (Heb.9:23-26) He is the Stone that the builders rejected. (Mat.21:42) And yet He remains the true Cornerstone. He alone can bring the Peace of Jerusalem. Because He, as Israel's Messiah, is the Prince of Peace. Indeed His coming is the only sure foundation for the restoration of Israel's Temple. We know that Messiah will return and come to His Temple. There must be a future peace in the Middle east. But how/ And by whom? And for how long? The Holy Scriptures have the answers to these questions. A future peace treaty will come in by a peace treaty. And this will be brokered by the prophesied global peacemaker of Dan.9:27? If such a man does arise on the world stage he will have to be a man of some stature and capability. He will need to be a convincing mega dealer and and a shrewd crisis manager. Will such a peacemaker arise in that future day? And just who will be the one who rises up on the world stage. Who will be the one to pick up the pieces and divide the spoils after that future war? The jigsaw puzzle of Bible prophecy is coming together for us piece by piece. The prophetic Word of God is being unsealed, just as Daniel prophesied. Yes, early on a "prince" will appear on the stage of history. (Dan.7-12) At the beginning he will take the spotlight in his 'peacemaker' or "Mr. Niceguy" role. (This global power broker will not remain as a peacemaker). But early on he will secure for himself enormous international power. He may step onto the world stage in a time of crisis and assume enormous powers as a global crisis manager. Perhaps sovereign power will be given him to disarm the world of weapons of mass destruction. What a hit that would be! But the dreams of secular humanism and Dominionist religious humanism are vanity. Yes, Lucifer must have his god-man as YHVH-God has his Emmanuel, God in the flesh. But history shows us that human beings cannot be trusted with power. And the scriptures are clear on the future acts of this "prince". He will go on later to break the covenant he has just made. (Daniel 9:27) Midway through the seven years Daniel tells us that he will be revealed as someone less than benevolent. (See (Dan.9:27 part B) He will turn out to be none other than the coming false messiah, the Beast Antichrist of 666. Moses gave a warning concerning this great latter day trial and tribulation for the covenant people of God. And Jesus/Yeshua Himself warned that His people would reject Him who came in His Father's Name and go on to accept another "prince" who came "in his own name". See this article and click on the scripture here which is John 5:43. BUILDING THE THIRD TEMPLE WILL REQUIRE PEACE IN THE MIDDLE EAST. AND THAT PEACE, ALBEIT A TEMPORARY ONE, WILL PROBABLY FOLLOW A SIGNIFICANT FUTURE WAR. THE 7 YEAR PEACE COVENANT OF DAN. 9:27 WILL BE CONFIRMED FOLLOWING THAT WAR. THE SEVEN YEAR COVENANT WILL BE BE BROKEN HALF WAY THROUGH THOSE SEVEN YEARS. BUT THOSE FIRST 3.5 YEARS OF PEACE WILL ALLOW THE REBUILDING OF THE THIRD TEMPLE. Just how will this Middle East peace be achieved? What will have happened to suddenly change the political equation and thus open the way to allow the Rebuilding of the Jewish Temple? For the status quo on the Temple Mount to change there will have to be an upheaval. The powers that currently control the Temple Mount will have to be swept aside. After this future war things will change. Islam will be sufficiently subdued to allow a Jewish presence on the Temple Mount. In view of Daniel's prophecy in Dan. 9:27we must assume that the future regime ushered in by this "prince" will provide the building authorization for the Third Temple. It seems clear that the peacemaker or power broker who does broker this sovereignty sharing deal involving Israel and western Christendom will be the one spoken of by the prophet Daniel. He will be the long awaited 'prince' who brokers the seven year peace treaty of Daniel 9:27. He is prophesied to "confirm a covenant with many" for a period of seven years. We do not know who this peace broker will be. But we do know this. He will the consumate humanist. Because we are told that He will come not in the Name of the God of Israel but in his own name. A "prince" will have come onto the world scene. His consort in religion will actually be the one who takes the reins of power initially before he grabs them halfway through the seven years. We have seen religious leadership before under Popes and Cardinals and Ayatollah's. This will be the climax of Dominion Theology and it will be an ecumenical religious mish-mash. John saw the harlot politico-religious system and was absolutely astounded at what he saw. See Revelation 17. A ten horned (Dan.7) ten toed (Dan.2) global rulership will emerge into world history. These are awesome issues to consider. The prophecy we are considering here is extremely important. Daniel 9:27 is the most significant prophecy for an overview of the latter days of this age. This seven year treaty, Israel's 'covenant with death' is the next big event to explode into history. It will almost certainly be the event which sees the next feast on the Hebrew calendar come up for fulfillment, the Feast of Trumpets. THE REBULDING OF THE THIRD TEMPLE AWAITS WORLD PEACE AND A NEW WORLD ORDER. THIS CHANGING OF THE GUARD WILL BE THE WAY THE FINAL SEVEN YEARS OF THIS AGE BEGINS. THIS "PEACE" WILL CALL FOR A SOVEREIGNTY GIVE AWAY BY ISRAEL AND THE WESTERN NATIONS. WHEN THAT HAPPENS THE WATCHMEN OF ISRAEL WILL NOT BE SILENT. THE DAY THE 7 YEAR COVENANT OF DANIEL 9:27 IS CONFIRMED THE TRUMPETS WILL SOUND THE ALARM. This extraordinary future seven year peace accord must be signed and confirmed. It must be ratified by many nations, including Israel, for global rule. Some awful collusions and compromises will be made by God's covenant people as they go through the confirmation of this "peace process". In this "covenant with many" (Dan.9:27) or "covenant with death" the holy things of God, including God's Holy Land Eretz Israel, even Judea and Samaria, will be divided up, even by fences. God's sacred land will be sold down the river, for a price. 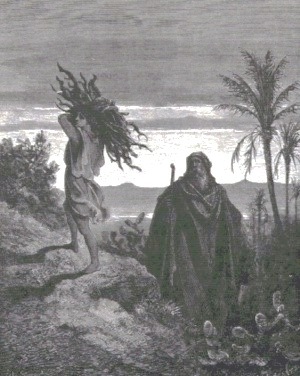 Moses warned the covenant people of God about this departure from the faith and the resulting tribulation that this compromise caused in the latter days. He prophesied that His covenant people would compromise the faith and come into a time of trouble and tribulation in the "latter days". It is right there in the Song of Moses. Moses said that God's people would end up getting themselves into some significant trouble. YHVH/God also spoke through the prophet Hosea. He declared that His covenant people were as Hosea's wanton wife, lost Gomer. His people would desert YHVH-God. They were a runaway bride. TIn the latter days they would get themselves into mischief and into a world of trouble. When that peace treaty is signed it will be an awesome day. There is no other word to describe it. The trumpets will be blowing in a great fanfare and in celebration of the event. Other trumpets will be blowing in alarm and warning. This will probably be the final epic fulfillment of the 5th feast of Israel, the Feast of Trumpets. This is the very next Hebrew feast due to erupt into holy history. As we shall discuss further on in this article, there is some good evidence that the peace covenant of Dan.9:27 will be confirmed right on a future Jewish new year. If it is the 7 year peace covenant of Dan.9:27 then it would herald the re-opening or resumption of the Seventy Weeks Prophecy. Daniel's 70th Week will have begun. What a day that will be! The trumpets will be sounding. They will announce the soon coming of the Messiah and the opening of that time "cut out and set apart by God" for His determined dealings with His covenant people. This will involve the Jewish nation of Israel, the G-7 nations, the holy city of Jerusalem, and the covenant Congregation/Church of the God of Israel scattered throughout in the world. It seems that the yet to be fulfilled Fall Feasts are not just quaint Jewish traditional celebrations of a bygone era. The fall feasts are precisely time linked to the beginning and ending of the 70th Week of Daniel. They are in fact way points into and out of the final seven years of this age. This story has not yet been told. Here it is in a nutshell. The Feast of Trumpets is a day of blowing of trumpets, trumpets of celebration? No, trumpets of alarm. The holy day after that is the Day of Atonement or Day of Reckoning which surely marks the last day of this age. Now when these two yet to be fulfilled feasts are separated by seven years and the two Tishrei months are connected by 86 moons and not 87 moons, (and this varies with where the seven year span is placed in the 19 year Hebrew metonic calendar cycle these two holy days mark out a feast to feast timespan of 2550 days. Now, let us go on to discover "the rest of the story". then we notice something absolutely astounding. 1260 + 1290 days =2550 days. We get precisely 2550 days! It is an exact fit! This epic future peace in the Middle East would certainly fit the spirit, nature, and purpose of this trumpet blowing scenario. The Feast of Trumpets is the first of the yet to be fulfilled Fall Feasts. 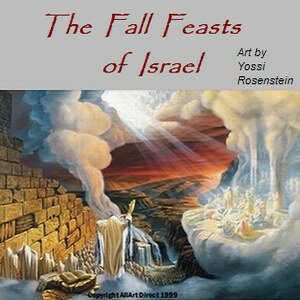 These are the final three feasts of the Seven Feasts of Israel. The Feast of Trumpets is characterized in Leviticus 23 as "a memorial day of blowing of trumpets, a holy, called out, assembly." (Lev.23:24) This just happens to be the very next feast to come to fulfillment. The trumpets will probably be blown by some in celebration and by others in alarm. (Joel 2) The watchmen of Israel will be sounding the trumpets of alarm and warning. They will be "calling out of everyone to a sacred assembly" before YHVH-God. This scenario fits the character and the drama of that awesome future day in which the seven year covenant of Dan.9:27 is confirmed. The scenario pictured for us in Joel chapter 2 fits the occasion very well indeed. This blockbuster future Daniel 9:27 peace covenant will not be something done in secret. Nor will it merely be a photo-op with a handshake and something signed on a piece of paper. It will not be just political theatrics or a hyped up event with no meaningful subsequent execution. We saw a demonstration of this sort of empty political showcasing with the PLO peace agreement signed on the White House lawn. This treaty had no "bite" to it and no sovereignty surrendered. It was not worth the paper it was written on. Then later we saw the Oslo accords signed. But this too was much ado about nothing. Oslo failed to bring in the desired peace in the Middle East. In fact, as we saw, matters went from bad to worse. Oslo certainly did not provide the peace to allow the rebuilding of the Jewish Temple. But this future seven year covenant will be different. It will be a major event. A significant level of peace will be achieved by this treaty, - for a while at least. And 3.5 years will certainly be enough time to rebuild the Jewish Temple. From what we see in the prohecy of the 2300 days the Temple may go up in a matter of 8 months. Will there be scarifices in the future Temple? Apparently so. The Temple Mount Faithful have been preparing for this for many years now. When the politico-religious status quo does change, and we know that it will from Daniel 9:27 then we can expect that the present impasse to the temple sacrifices will be swept aside. The trolls at the gate of the Temple Mount will no longer deny worshipers of YHVH-God from entry to the Holy Place. And the required permission to reinstate the Jewish sacrifices will be granted. Then the long awaited moment will be realized. In the excitement and the onrush of events the Hebrew sacrifices could resume on the Temple Mount almost immediately. This would be truly historic. The period of desolation without sacrifice has already lasted 1938+ years. This seven year peace covenant is one of the the next big events in holy history. Israel will hand over control of the sovereign, God given, holy, consecrated, Land of Israel. They will hand it over to someone who comes not in the Name of the God of Israel but in his own name. This megadeal will open up the 70th Week of Daniel. The power broker will not be who he seems to be. He will be revealed later to be a false messiah. The importance of this seven year covenant with "many" cannot be overstated. Its reality and its significance will be proven by the extraordinary subsequent seven year history that emerges from this peace treaty. When this covenant is signed and confirmed there will be huge consequences for Israel and for Western Christendom. Great and awesome events will start to happen. This is clearly laid out for us in both parts of Daniel 9:27 as well as numerous other passages in Daniel's prophecies. Other Old Testament prophets tell the story as well as Jesus/Yeshua Himself in the Olivet Discourse.